The Chronic Art Foundation, the CLF (Chronic Love Foundation), the Hannah Barry Gallery, and Peckham Vision, this week burst out into the public arena from their bases in and around the historic Bussey Building behind 133 Rye Lane. They are making a major contribution in many forms of art, music, architecture and urban planning in the ‘I Love Peckham Festival’. All of this could be wiped out by TfL’s (Transport for London) plans to demolish the Bussey Building and the 7 acre site around it for the Cross River Tram Depot. TfL promised to do a thorough review and exploration of other sites for the several depots needed across the whole proposed network from Camden to Peckham & Brixton. But they have said nothing for two years. Meanwhile, in spite of the blight this has caused, the site they declared incorrectly as ‘derelict’ continues to go from strength to strength contributing magnificently to Peckham’s cultural, economic and social renaissance. Modern Music & Art blends with Historic Peckham. Dates for the diary during the I Love Peckham Festival this week: a visible expression of the burgeoning cultural creativity in and around the historic Bussey Building behind 133 Rye Lane. Monday 14th to Sunday 20th July, daily 1pm to 5pm: art, architecture, & town centre plans. Chronic Art Foundation exhibitions, 1st & 3rd floors, Bussey Building, 133 Rye Lane entrance. Wednesday 16th July, meet 6.30pm at Peckham Town Square. town centre architectural walk including historic Bussey Building & newly listed station. Saturday 19th July, 2pm Public Debate: Peckham’s cultural renaissance. live with South City Radio, 3rd floor in Bussey Building, 133 Rye Lane entrance. Sunday 20th July, 8pm to midnight, Closing Live Music Celebration of Festival. 1st floor Bussey Building, 133 Rye Lane entrance. Monday to Sunday 1pm-5pm daily. Venue: Bussey Building, 133 Rye Lane entrance. 3rd floor Peckham Futures – visions and ideas for developments in central Rye Lane in and around Bussey building and adjacent sites. Monday to Sunday midday to 6pm daily. Venue for the outdoor exhibition: 10th Floor Multi-Storey Car Park, behind Multiplex Cinema: lift to Level 6. Follow signs to Level 10.
monumental outdoor sculpture specially made for the show ‘Bold Tendencies’. Town Centre Walk: WEDNESDAY 16th JULY 6.30pm to 8.30pm. Walk begins at Peckham Square. Highlights include historic Victorian warehouse factory the Bussey Building & recently listed Peckham Rye station. Led by local architect Benedict O’Looney. Chronic Art Foundation with South City Radio (formerly Radio Peckham). Venue: 3rd floor Bussey Building, 133 Rye Lane entrance. PUBLIC DEBATE live on The Primer radio programme with – ‘How Do We build the Culture Capital of London?’ Afternoon refreshments. The Peckham Futures exhibition: plans, visions, ideas for exciting, sustainable regeneration in this heart of the town centre, nurturing creative businesses that have taken root in the Bussey Building and surrounding area. Saturday 11am to 7pm; Sunday 12 noon to 7pm. The I Love Peckham Festival Finale 2008. Cutting edge Live Music, Food, Art and Life. Peckham Square and beyond – 2 days, 6 stages of over 250 artists. Celebration: SUNDAY 20th JULY 8pm to midnight. Festival Closing Event with live music & refreshments . Venue: 1st floor, Bussey Building, 133 Rye Lane entrance. Southwark News reports: ‘A Freedom of Information request has revealed that the depot for the Cross River Tram could end up just off the Old Kent Road. Transport for London (TfL) had been reluctant to release the alternative sites which could park up to 48 trams, after an inspection of the favoured Peckham site stated that it should not house all the trams and that inspectors “..were not convinced that the site is the only feasible option for a single or principal tram depot.”. The response to campaign group Peckham Vision showed that a site on Ilderton Road, near Millwall’s ground The Den, could be an alternative to the Peckham site and is so large it could house all the trams. 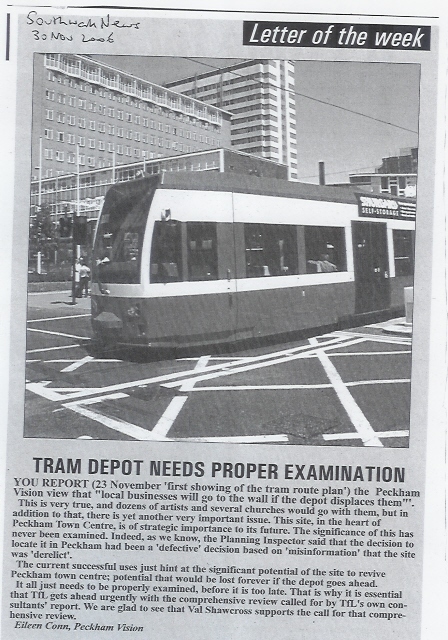 You report (23 November ‘first showing of the tram route plan’) the Peckham Vision view that “local businesses will go to the wall if the depot displaces them”‘. This is very true, and dozens of artists and several churches would go with them. But in addition to that, there is yet another very important issue. This site, in the heart of Peckham Town Centre, is of strategic importance to its future. The significance of this has never been examined. Indeed, as we know, the Planning Inspector said that the decision to locate it in Peckham had been a ‘defective’ decision based on ‘misinformation’ that the site was ‘derelict’. The current successful uses just hint at the significant potential of the site to revive Peckham town centre; potential that would be lost for ever if the depot goes ahead. It all just needs to be properly examined, before it is too late. That is why it is essential that TfL gets ahead urgently with the comprehensive review called for by TfL’s own consultants’ report. We are glad to see that Val Shawcross supports the call for that comprehensive review. A Peckham resident won Letter of the Week in the South London Press (SLP) (24 November). She has recently moved to Peckham and been shocked to discover the plans to decimate the centre of Peckham for the tram depot. Your Letter of the Week (24 November) drew attention to the devastating impact of the plan to put the tram depot in the heart of Peckham Town Centre. Thank you for seeking readers’ views on this, as it is essential there is a well informed debate about the issues this raises before final decisions are made. Peckham Vision, a group of local residents, traders, and artists, came together to do just this. It has become obvious that this site may have significant potential for a whole new approach to Peckham Town Centre. The current uses are a mix of small start-up businesses, creative arts, and community centres in churches, and they give just a hint of the potential role the site could play at the heart of an integrated regeneration of Peckham town centre. The significance of this has never been examined. Indeed, as we know, the Planning Inspector said that the decision to locate the depot in Peckham had been a ‘defective’ decision based on ‘misinformation’ that the site was ‘derelict’. It could be that the site is a priceless asset for a different future for Peckham town centre, a future that would be lost for ever if the depot goes ahead. This is not necessarily to be against the depot at this stage. But it all just needs to be thoroughly examined. That is why it is essential that TfL gets ahead urgently with the comprehensive review called for by TfL’s own consultants’ report. Campaigners in Peckham are dismayed after they discovered the reduction in size of the planned depot for the Cross River Transit in their town is only 0.4 of an acre – this after Transport for London were ordered to make it smaller by government inspectors. The local residents group Peckham Vision have obtained copies of the altered plans through the Freedom of Information Act, and are reported to be “angry” and “dismayed” that they are not going to spared a large depot in the area. Southwark Council and the Nunhead and Peckham Rye Community Council to attempt to ensure everyone in the area who wants a say, and is affected by the plans, is heard. Transit on 11 November, but this is not due to feature are dialogue on the location of the depot. The Council is going ahead with its plan to impose the Cross River Tram Depot on a huge site in the middle of Peckham Town Centre before there has been adequate evaluation of its impact. The site is teeming with economic and social life, has significant potential for revival, has hundreds of jobs, dozens of businesses, several churches, scores of artists, lots of housing, and lots of adaptable buildings. So demolishing it would have serious adverse effects. These were recognised by the Government Planning Inspector after the Public Inquiry into the UDP (Unitary development Planned for the borough). He said the comparison with all the many other sites which had been examined had been based on the misinformation that the site was near derelict, and so it was a defective decision. He recommended instead a ‘split-site’ Depot there, ie part of the Depot in Peckham and part somewhere else, and this has been put into the modified UDP coming out for consultation from 1 September to 13 October. The problem is that the words in the UDP put no limit on the size of a ‘split-site’, and it could have just as many adverse effects effect a brand new policy on land use in Peckham Town Centre, and the 6 week consultation on the UDP modifications in September/October is the first and only time to make comments before the UDP is finalised. To be meaningful there has to be information from TfL about the size and arrangements of the Depot plans they are working on now. Peckham Vision is campaigning to get this information released. Anyone with an interest in Peckham Town Centre can help by asking their ward councillors, GLA member, and MP to press TfL for information and openness about these plans at this critical stage. If you support this campaign, join the mailing list, and keep in touch. Please email info@peckhamvision.org. Thank you for drawing attention to the proposal to locate the Cross River Tram Depot in the heart of Peckham town centre (SLP 30 June). The Planning Inspector rejected the original proposal to locate the whole of the depot in Peckham because of the potentially destructive effects on the town centre and on jobs, businesses, churches and homes. He said that the choice of Peckham in the first place had been defective as it was based on the Peckham site being near derelict. He reported that this was �simply not true�. The problem is that any so called Split-Site Depot in Peckham may in practice be the main (if not the only) Depot and could be almost as huge as the original proposal. This might have as many adverse effects as the original proposal rejected by the Planning Inspector. The key point is that no-one knows what the plans might be. The Split-Site Depot is in fact a new policy at the last minute in the Unitary Development Plan process. There is, for example, no information about its size, how many jobs, homes, and other activities would be displaced, where the trams and heavy engineering workshops would be in relation to neighbouring homes; and there has been no consultation about it at all. It is urgent that TfL release this information. It is urgent that they get on with the review of the site options for the Split-Site Depot and get Peckham properly compared and evaluated alongside all the other options for the first time. The issue is the lack of transparency, and the rush to premature decisions based on defective information. Peckham Vision was formed to campaign precisely on this point (not as a preservation group). Information needs to be publicly available now about these plans so we can all have an informed discussion about the future of Peckham Town Centre. Then we can have sound decisions on where the Tram Depot should be located. Cllr Kim Humphreys deputy leader says� (Southwark News 29 June) we need to think about the economic benefits of a tram. This is so, but it is a major diversion from the different and important issue in Peckham Vision�s deputation to full Council on Wednesday 28 June. Any decision now to allocate a huge site in the heart of Peckham town centre for a tram DEPOT is premature. The land now proposed to be safeguarded for a �Split-Site� Tram Depot is the same as the site previously identified for a single-site depot. There has been no reduction. No information is available from Transport for London on how big the Depot would be, and how close the noisy and disruptive parts of the depot would be to the hundreds of neighbouring houses, never mind the loss of jobs, businesses and creative cultural activities. These are all major economic benefits, without the depot. It is vital that this information is supplied for an informed public and transparent assessment of the positive and negative effects on jobs, businesses, homes and disruption to Peckham. The information on which previous decisions were taken to locate the Depot in Peckham is seriously inaccurate, misleading and, as the Planning Inspector put it, �simply not true�. Will he now honour his promise? Will he now press Transport for London to get ahead urgently with a full public review of all possible sites for the new policy of ‘Split-Site� depots? Will he get Peckham included so that we can have these discussions? TfL’s new plans for the split-site tram depot in the heart of Peckham town centre could have devastating effects on homes, jobs, businesses, artists and other community uses, and blight the town centre for years. We just don’t know exactly what the effects will be because no information has been released about these new plans. We do know that the Planning Inspector has already rejected the original plan because of its devastating effects. There are indications that the new plans could be as bad. to reveal their plans for a depot on this huge site in the heart of Peckham town centre so that there can be a transparent and informed discussion about the effects on Peckham. to conduct a full public review of all split-site options and alternatives. suggested the UDP be modified so that the site would be: ‘safeguarded pending a full public review of all split-site options and alternatives’. The deputation were dismayed that the Executive rejected this modest and practical proposal. The deputation on Wednesday will be drawing these important matters for the future of Peckham to the attention of the full Council, andseeking cross-party support to put pressure on Transport for London to release information about their latest plans and urgently conduct a public review of split-site options and alternatives. Only then can anyone assess what the effect would be on Peckham. Peckham Vision is a consortium of local residents, artists and businesses, who have come together with the Peckham Society, to seek information about the development plans for Peckham Town Centre, including the tram and tram depot, raise public awareness of these issues and stimulate an informed discussion about the future of Peckham. Peckham Vision will be asking the Executive to get a full review of the possible sites and a comparative evaluation of them before the final decisions are taken about a tram depot in Peckham. Otherwise this will be another ‘defective’ decision, as the Inspector called the original choice of Peckham for the depot. ‘single-site’ tram depot because of the loss of jobs, businesses, housing and community uses, and the disruption it would cause to the town centre. Instead he recommended a ‘split-site’ tram depot, but, unfortunately, did not put any limit on the size and arrangement of the split-site depot. The indications are that the new split-site depot proposal will still be very big, and may have similar damaging effects on the town centre as the single-site depot. Peckham Vision deputation told the Planning Committee last week that the decision to designate this site now for the tram depot, without having these details, was premature. Before a final decision, there should be a thorough review of the effects on Peckham town centre and a comparative evaluation with the other sites.